NOS GM EFI Nitrous Systems are the best way to get a power increase in your fuel injected, late-model performance vehicle. Nos ''Dry'' Nitrous systems get extra fuel for the boost in power from the stock injectors. The ''Wet'' nitrous systems use a direct-port style nozzle to introduce nitrous and fuel into the intake runner. 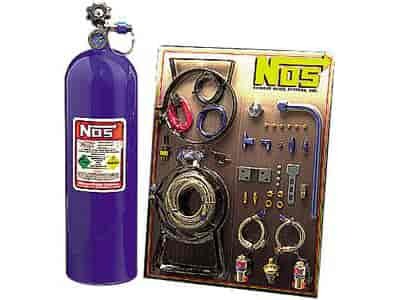 All NOS EFI Nitrous Systems include a 10-lb. bottle (shipped empty), nitrous solenoid, aircraft-quality braided steel hose, nitrous filler, jet selection, aircraft-quality fittings, switches, brackets and all hardware needed for a complete installation. Does NOS 05177 fit your vehicle?